The Milwaukee Brewers are just one win away from the NLCS series. If the Brewers can defeat the Arizona Diamondbacks tomorrow night, they will officially eliminate the Cardinals and move on to the next round. 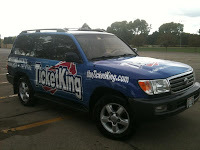 Ticket King Milwaukee has Milwaukee Brewers NLCS tickets available. Now, just so you know, if you purchase tickets for Brewers playoffs games that do not get played, you will be issued a full refund. As was the case in the first round of the Brewers playoffs, the will call option will not be available at Miller Park. If you're looking to park your car at Miller Park, you must purchase a parking pass in advance. Fingers crossed that our Milwaukee Brewers win tomorrow night and then you can start making arrangements for the NLCS. Go Brew Crew!